Sydney Local Health District (SLHD) developed a clinical pathway to identify patients who have iron deficiency anaemia. A strategy was implemented to manage identified patients with intravenous iron therapy prior to high-risk elective surgery. To achieve 100 per cent compliance with preoperative iron deficiency screening for patients receiving high-risk surgeries, or surgeries where substantial blood loss is anticipated, by August 2018. To reduce instances of red blood cell transfusions throughout the perioperative period by 20 per cent (baseline 3,300 transfusions per year), by August 2018. Provides a coordinated approach to iron deficiency identification and management. Empowers clinicians to identify and appropriately manage patients with iron deficiency before high-risk surgery. Prepares patients for high-risk surgery or where substantial blood loss is anticipated. Reduces the need for intraoperative or postoperative blood transfusions. Improves patient experience, decreases length of stay and reduces mortality and morbidity associated with blood transfusions. Provides tools and a clinical pathway to manage iron deficiency internally and externally. Provides a multidisciplinary team approach to preoperative patient preparation. Ensures all patients are managed as per national guidelines and international best practice. In 2009, transfusion medicine practices began to significantly change following new evidence demonstrating the negative effects of blood transfusions. Research has found that red blood cell transfusions are associated with increased morbidity and mortality1. In 2012, the National Blood Authority released Patient Blood Management guidelines to provide guidance on ways to optimise patients and decrease inappropriate blood transfusions. One of the recommendations was the proactive identification and management of iron deficiency. The guidelines stated that in Australia, 30 per cent of all patients receiving high-risk surgery or surgeries where substantial blood loss was anticipated were iron deficient and/or had anaemia2. To manage iron deficiency, anaemic patients require an intravenous iron replacement. Internationally, research has found that patients identified and managed with intravenous iron use 28 per cent less red blood cells. In addition, the average length of stay of managed iron deficient patients is reduced by 2.5 days3. Within SLHD, it was identified that colorectal and upper gastrointestinal services used substantial amounts of red blood cells. These services undertake extensive and complex procedures requiring significant amount of blood products. Following an increase in red blood cell use in 2016 and 2017, an analysis was completed to identify practice gaps. 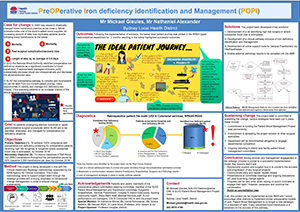 Iron deficiency identification and management was found to be an area for improvement, due to the lack of process and support systems available to clinicians. A steering committee was established to monitor the progress of the project against its objectives and ensure it aligned with SLHD’s organisational strategy. Reports were also provided to SLHD committees, including the Patient Blood Management and Transfusion Committee, and Clinical Quality Council. Throughout the diagnostic phase (May 2017 – October 2017), 144 retrospective audits were undertaken across colorectal and upper gastrointestinal services at Royal Prince Alfred and Concord Hospitals. 12 patient interviews, three staff consultation workshops, six process maps and a root-cause analysis were also completed. A high-risk surgical list was developed in December 2017, to help clinicians in each service identify who required testing for iron deficiency. In January 2018, a clinical identification and management pathway was established. Each facility had minor variations in their management strategy, to cater to their ability to infuse intravenous iron. Following staff consultation and training sessions, a pilot pathway was introduced in Royal Prince Alfred Hospital’s upper gastrointestinal services in February 2018. Remaining services will implement the identification and management clinical pathway in March and April 2018. In February 2018, an agreement was reached with SLHD Community Nursing, to allow patients to visit community centres for intravenous iron infusion, so they can receive treatment closer to home. Sydney HealthPathways is currently being updated with support materials for General Practitioners who refer patients to SLHD. Uploading external pathology results into patients’ electronic medical records is also taking place. patient interviews to review current progress achieved by the clinical pathway. The retrospective data collected during the diagnostic phase of the project has been presented at various forums, clinical meetings and morbidity and mortality meetings. As of March 2018, early reports indicate a positive response to the pilot pathway at Royal Prince Alfred Hospital. Sponsorship support and surgeon buy-in is crucial to the success and progression of any surgical projects. A strong case for change and vision will drive your project. Communicate early and be consistent with your messaging. Complete a heat map review of services which will require behavioural change early. Try to avoid a year with accreditation. Presentations at committee meetings and ongoing discussions will yield surprising change advocates. Strong relationships with case managers and clinical nurse consultants managing surgical services are the key to change implementation. Progress can be slow when relying on others to engage their teams, persevere and continue the conversation. Tinmouth A, Fergusson D, Yee IC et al. Clinical consequences of red cell storage in the critically ill. Transfusion 2006;46(11):2014-27. National Blood Authority. Patient Blood Management Guidelines. Module 2: Perioperative. Canberra: National Blood Authority; 2012. Calleja JL, Delgado S, Val AD et al. Ferric carboxymaltose reduces transfusions and hospital stay in patients with colon cancer and anemia. International Journal of Colorectal Disease 2016;31(3):543-51.